When I made the chicken, roasted red pepper and goat cheese lasagna I did not have the shredded chicken on hand. The easiest way to get shredded chicken is to roast a chicken and so I made my favourite version, a lemon and oregano roast chicken . After making the lasagna, I had some some of the chicken left over and so I started to contemplate ways to use it. I was thinking that the lemon and oregano flavouring on the roast turkey reminded me a lot of the marinade for my chicken souvlaki and this led me to think that a ‘souvlaki’ chicken salad sandwich would be pretty good. I started the ‘souvlaki’ chicken salad with the chicken and some of the flavours from the souvlaki marinade including the lemon, oregano and garlic. I had used the chicken for the lasagna right away I did not get the chance to use the drippings so I put had them in a container and stored them in the fridge. Since the drippings are just packed with flavour, I skimmed the fat from the top, warmed them up and added them to the chicken salad. From there I added some things that I often add to my chicken souvlaki gyros, namely some roasted red pepper , red onion, tzatziki and feta. These sandwiches were amazing! The lemon, oregano, garlic and red pepper flavour combination was really tasty and the red onions added a nice contrasting sweetness followed by a bit of bite. The salty feta and cool and creamy tzatziki finished off the sandwich nicely! Mix the warm shredded chicken in the lemon, oregano, garlic, oil, drippings, salt and pepper. I wish I were sitting at your table! this, no, you need to open a sandwich shop. period. with all those creations? dude, for real come on. Souvlaki chicken salad! What a great idea! This sandwich sounds wonderful,so tasty! I would really appreciate ur comment!! That looks so tasty! Every time I see your blog I end up getting hungry lol! This sounds amazing! I love that you used tzatziki in place of the mayo. Good call. Heaven knows Kevin, they call me the sandwich queen, but I have seen some amazing sandwiches on this site and this one is no exception!!! This is the perfect sandwich! And packed with flavor. You really should open a gourmet sandwich shop! Mmmm! Sounds like a gyro but in sandwich form. You're making me hungry! What a hearty and flavorful sandwich – I could go for one now! Hi! Nice to meet you! I've just found your blog…and you! Rare you from Canada! Ah..I love Canada! I visited your country some years ago and i fall in love with it! But you're a good chef too! This sandwich is soooo delicious!!! A very grat idea! It looks great. I'm going to try it this weekend! 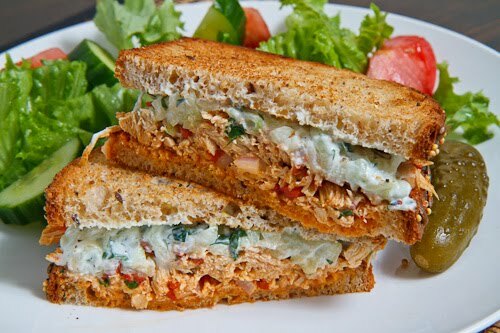 I love chicken salad sandwiches. Finally a great idea for leftover Souvlaki. I have so much from a dinner party and did not want to reheat them as they may just dry out.